Looking much the same as the Q7, the new SQ7 has some subtle details in the exterior design that suggests that this model has more power and greater control. The all-new Audi SQ7 is on our shores, is a powerhouse and is a special beast to behold. From the rear there are chrome-tipped quad exhaust outlets, a chunky-barred radiator grille rimmed in chrome, a low slung air dam with a continuation of the lattice shown in the grille and massive low-profile alloys to keep you in secure contact with the road. 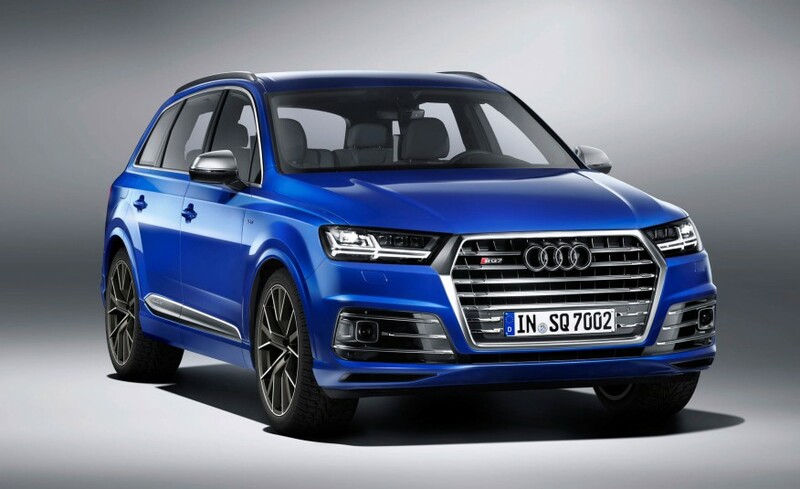 Sitting slightly lower than the standard Q7, the curved profile of the SQ7 is sportier and meaning business. 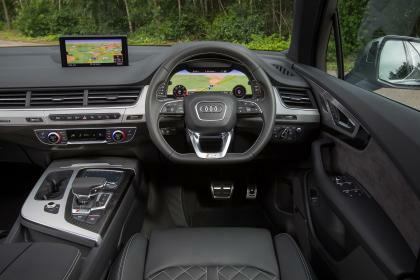 Have a look inside and you’ll also notice the S logo printed on the leather seats. Beautifully crafted and impeccably designed, the new Audi SQ7 takes on the Range Rover Sport, Infiniti QX80, and the array of sports/luxury SUVs to come from the Mercedes Benz, Jaguar and BMW stable. So what’s there to set the new SQ7 apart? The truth be told, each of the above mentioned SUVs have plenty of power and copious luxury to be considered as parliamentary contenders. The new Audi SQ7 writes a new piece of legislation of its own. Where the Range Rover Sport and Infiniti QX80 are almost snobby, the SQ7 comes in as a bit of techno geek with huge dynamic ability and world-beating performance to boot. Not even the best Merc will cope with Audi’s new TDI donker found under the hood of a new SQ7. There are enough horses under the bonnet of an SQ7 to pull a B-train across the Outback, and the Quattro dynamics makes this the real luxury sportster of the big SUV rides. Delivering 900 Nm of torque and 320 kW of power, there are big trucks which start to look rather modest on paper when stacked against the new SQ7. Setting the benchmark as the most powerful diesel SUV on the market, the Audi SQ7 accelerates from 0 to 100 km/h in just 4.9 seconds and has a limited top speed of 250 km/h. The unassailable all-new twin-turbo 4.0 litre V8 TDI engine has also ensured that efficiency is also part of the performance equation. The massive torque is available between 1000 and 3250 rpm and it’s employed using two turbochargers and world first electric supercharger. New Audi’s always seem to have a bit of an aura about them when you meet them on the road. These Q7 models (much like the Range Rover Sport) are suited for those with plenty of cash and, perhaps, run a Cooperate business or suchlike. It certainly won’t look out of place as a racehorse breeder’s vehicle of choice nor a main drive for a director of a company. Sit yourself down inside one of these and it’s all about luxury and comfort. The new Audi SQ7 rides beautifully over any sort of road surface, and is still handy off-road if you dare to take it there. Somehow I can’t see too many of these vehicles tackling many forestry tracks or serious Outback terrain – I wouldn’t want to scratch the gorgeous paint finish! 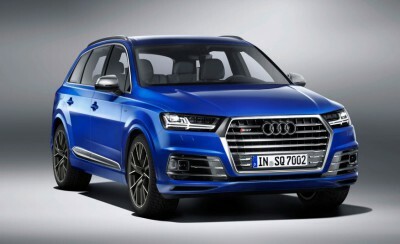 I imagine that if you do buy into the most powerful SUV that money can buy, you won’t blink an eyelid at purchasing any of the many customizing options available for making your own SQ7 very rare and distinctive. An attractive range of Audi exclusive leather upholstery and trim possibilities extends the interior options for the Audi SQ7. Audi’s exclusive inlays create a cabin character all of its own and you’ll truly have a very sporty and select look. To finish it all off, why not utilise the customised Audi exclusive paint finish giving your Audi SQ7 a particularly distinct touch. It’s not really necessary to go into any depth about what luxury, safety and comfort features will be aboard this mile muncher, as it’s already fully loaded with everything imaginable. Audi’s new SQ7 makes the statement of being the best sports/luxury SUV on the planet and, in driving one, one sees just how far ahead the SQ7 has become. For any more information on the Audi SQ7 or, for that matter, any other new car, contact one of our friendly consultants on 1300 303 181. If you’d like some fleet discount pricing (yes even for private buyers! ), we can submit vehicle quote requests out to our national network of Audi dealers and come back with pricing within 24 hours. Private Fleet – car buying made easy!